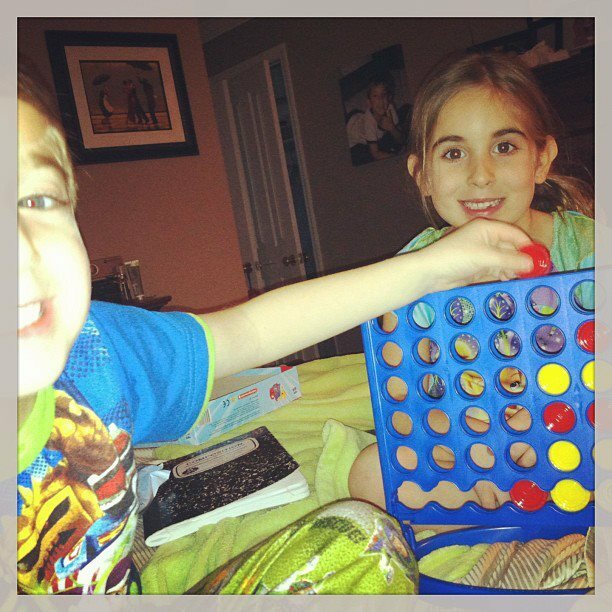 We love to play games as a family. Sometimes it’s video games … I’m not going to lie. But more times than not it’s a good ol’ board game. I grew up playing board games with my mom – so it only makes sense that it’s a part of my kids’ lives as well. The kids had a great weekend. Every single day they had very LONG play dates with friends. After spending several hours with their buddies last night, they came home WIRED. So, they showered, changed into their PJs and whipped out some entertainment. Bill and I kept score while Natalie and Liam zipped through Connect 4. We had to keep telling them who won. They were like animals shoving their colors into the slots. We kept telling them that you have to THINK about what you are doing. The message was not received – but the laughs happened regardless. I guess the lesson out of all of this is you don’t need to go anywhere special. You don’t need to spend a lot of money. You don’t have to pre-plan anything. Quality time with the kids can happen just about anywhere.